Hemp cultivators have long relied on cloning as a way to propagate plant inventory and preserve their genetics, but the practice of taking a rooted cutting from a mother plant may be giving way to a new method of preserving a plant’s genetics: tissue culture. Plant tissue culture is a collection of techniques harnessed to maintain or grow plant cells, tissues or organs under sterile conditions in culture media, a rich blend of ingredients that promote plant-cell growth. The process is widely used to produce plant clones using a method known as micropropagation. “These techniques are done in Big Ag, the food industry. We’re just adapting what’s already out there,” said Hope Jones, CEO of Emergent Cannabis Sciences, a cannabis consulting firm in Phoenix specializing in tissue culture. Significantly more efficient and prolific plant production, enabling growers to save money and increase revenue. The ability to better preserve cannabis genetics. More vigorous plants than those that come from clones. Tissue culture also lends itself to multiple business models. A small number of cannabis cultivation companies have adopted tissue culture as a way increase plant counts, while ambitious entrepreneurs have started nurseries to supply hemp farmers small and large. It can also be used by small growers to preserve genetics or for proof-of-concept efforts that show how strains can be replicated through tissue culture. But setting up a tissue-culture shop requires expertise, time and capital – tens or hundreds of thousands of dollars, depending on the size of your business, your goals and where you get your equipment and labor. If done correctly, an investment in tissue culture can take your grow to a new level. “Most anyone who has the desire, the willingness and some funds to designate to this can do it. Who should do it? That depends on what their goals are,” Jones said. Jones noted that 100 clone cuttings per month (a relatively high number) can yield about 5,500 clones per month, or 66,000 clones per year. By contrast, 200 nutrient vessels with five plant clippings each will yield 2.4 million plants per year. There is also less genetic variation in plants grown from tissue culture than plants clipped from mother plants. Another advantage of a tissue-culture operation is that it requires less space than clones do. 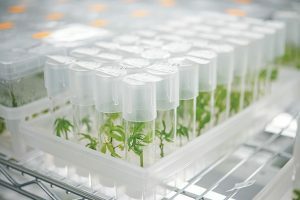 Grant Guelich, a cannabis consultant for Vancouver, British Columbia-based Weekend Unlimited, estimated that outfitting a tissue-culture space costs about 75% more than a space needed to produce an equivalent number of clones; the tissue-culture space, however, will be roughly 10% the size of the space needed for clones. For example, making 2 million clones yearly with traditional methods would require a 30,000-square-foot space; with tissue cultures, it only requires 2,000-3,000 square feet, Guelich estimated. Large Canadian marijuana cultivators such as Canopy Growth, Hydropothecary, and AgMedica Bioscience are setting up tissue-culture operations to produce at least some of their plants. They also see it as a way to outproduce the competition in a national marketplace, industry insiders said. Others like Front Range Biosciences in Lafayette, Colorado, have harnessed tissue culture to start nurseries that provide cannabis plants to farmers. Under its model, Front Range breeds high-CBD strains and then uses tissue culture to micropropagate those strains to produce young plants that are sold to farmers. “On the production side, tissue culture is a tool to produce cleaner, healthier, more efficient plants,” CEO John Vaught said. Tissue culture can also be useful to growers or others who may not want to scale but would use the procedure to preserve their plant genetics. “If you’re a breeder and you’ve spent years developing a valuable strain, tissue culture is worth considering because you can use tissue culture as a way to better preserve your genetics,” Jones said. Finding people who are qualified to run or work in a tissue-culture operation isn’t easy, and it requires an employer willing to pay competitive salaries. Guelich estimated that entry-level employees or low-level technicians in Washington state can expect annual salaries of $40,000 to $60,000. In Arizona, those positions typically pay $17 to $20 per hour, Jones said. For a lead manager with tissue-culture experience, salaries can easily approach $130,000 or more per year, depending on the size of the operation and the employee’s level of expertise. “People who are qualified for these positions will often have Ph.D.s and want to get paid accordingly,” Jones said. While tissue culture is high-tech and can take cannabis production to new levels, it’s still a relatively new tool in marijuana that the industry is learning about. “We’re still waiting for certain robotics and automation to come in and help get us beyond the bottleneck for really being able to get into production that is in the millions,” Jones said. This article originally appeared in the March issue of Marijuana Business Magazine.